Effective March 15, 2018 the Amazon Visa will be no longer. The Amazon Visa was a popular credit card in Canada for foreign exchange purchases, and card I exclusively used for spending outside of Canda. Most credit cards charge a 2.5% surcharge on top of the foreign exchange rate when purchasing outside your domestic currency, but the Amazon Visa waived that fee, which was essentially a 2.5% bonus when shopping in foreign currency. For example, if you are Canadian and travel to the US, most purchases while on your trip would be in USD. If you were to make the purchase with a typical credit card, the credit card would convert the purchase amount to your home currency (using the spot foreign exchange rate) AND add a 2.5% surcharge for the convenience of using a credit card. Maybe not a big deal at first, but if you regularly make USD purchases, the 2.5% surcharge is $25 for every $1,000 spent. This is a viable Amazon Visa replacement that has no annual fee and no foreign currency conversion surcharges. Like the Amazon card, it gives you 1% cash back as well. The only downside is that it is a little light on insurances, so not likely a great replacement for your regular everyday spending. The Roadside assistance freebie looks like a nice addon but make sure to check out the details. From what I’ve read, it’s only 5km towing coverage which may not be enough. Visa Auto Rental Collision/Loss Damage Insurance. This is a newish credit card offered by Rogers Bank, and really only geared towards Rogers customers. Technically, it may not belong in this list because it has a $29 annual fee, but the fee is waived if you charge a Rogers service to the card (the first year is free regardless). What’s attractive about this card is the 4% cash back on foreign currency transactions, which works out to be a 1.5% net benefit after counting the 2.5% FX surcharge. What’s also attractive is the 1.75% cash back on everything else. For a pseudo-free credit card, 1.75% cash back is huge. Note though that the cash back accumulated is supposed to be used towards Rogers services, you can request a statement credit instead via telephone once a year. Annual Fee: $0 if you pay your Rogers bill with this card $29 otherwise. $29 annual fee waived if you charge a Rogers service to the card (first-year annual fee is automatically waived for all users). Cash back must be used towards Rogers products or phoned into Rogers Bank in December to apply the accumulated cash back as a statement credit. Must be Rogers customer to waive the annual fee. The Fido MasterCard is very similar to the Rogers MasterCard above, but with slightly less cash back and no annual fee to think about. 4% cash back on foreign currency transactions, which works out to be a 1.5% net benefit after counting the 2.5% FX surcharge. This card also offers 1.5% cash back on everything else. Note though that the cash back accumulated is supposed to be used towards Fido services, and you may be able to get a statement credit instead by phoning in (like the Rogers card). 1.5% cash back on everything else. Cash back must be used towards Fido products or phoned into Rogers Bank in December to apply the accumulated cash back as a statement credit. The competition for foreign currency purchases is pretty tight and the best card will depend on your specific circumstances. If you are a Rogers customer, I can see the Rogers MasterCard being more attractive than the rest. The same can be said for Fido. At the moment, I personally use a combination of three free cash back credit cards. A capital one 1.5% cash back card (not available anymore) for my main spending; the 3% PC Financial World Elite Mastercard for grocery shopping (see promo below); and the Amazon Visa when traveling out of the country. With the Amazon Visa going away and being an existing Rogers customer, the Rogers MasterCard is an attractive option not just for foreign currency purchases (4% cash back), but for everyday purchases (1.75% cash back). The only downside is the non-existent insurance coverage which is why I’d need to keep my Capital One card on hand. 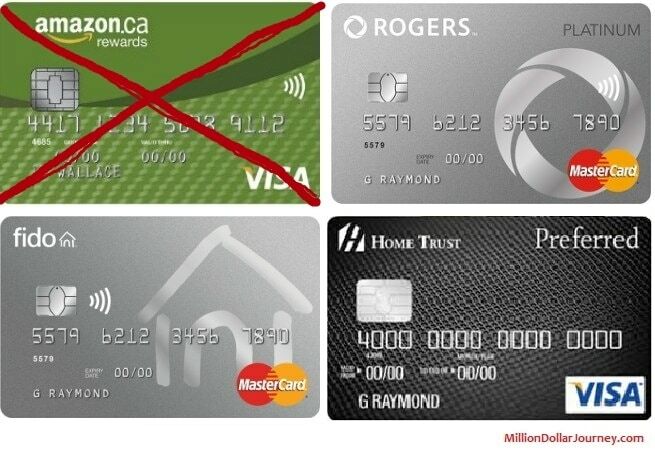 However, if you aren’t using Rogers/Fido services, then the HomeTrust Visa really is an attractive option. It’s essentially the Amazon Visa with the extra benefit of light roadside assistance and car rental insurance coverage. If you are interested in the generous and free PC Financial World Elite MasterCard (3% cash back at Loblaws group of companies) mentioned above, check out the limited-time $100 gift card sign up bonus (plus $20 in groceries) if you sign up through Rate Supermarket. More details here. Another consideration for foreign currency purchases is the possibility of returns. Years ago, my family booked a cruise in US$ on our Canadian credit card, but shortly after found some problems with onboard services. In the end we got a full refund. Or so we thought. Even though the refund was posted just after the purchase, the credit card company dinged us with an exchange fee amount in both directions. $200 lesson learned. The moral of the story: either ensure you have a card that does not charge an exchange fee, or do like we did and get a $US credit card (free to us as TD all-inclusive customers) which we pay off in US dollars (I control the exchange!). This is a great point. I’ve been using a US$ CC for a while now because I’ve been a victim of this in the past. It’s bad enough you pay 2% fees when you purchase something in a foreign currency on a C$ CC. It’s even worse when there’s an errant charge that’s refunded and you get hit both ways for a product/service you don’t end up receiving. How does PC Financial MasterCard stack up? Bernie, unfortunately PC Financial charges 2.5% on foreign currency transactions. So if you are in the US, your net cost would be 1.5% surcharge after counting the 1% cash back. Tangerine is our go to card for travelling. Entertainment and Restaurants are the two options on the Tangerine card. This helps to track the “Out money” for our budget when we are in Canada. And it helps reduce the cost when traveling, because Entertainment and Restaurants is the main thing you do during the traveling anyways. What is your thought of Scotiabank Momentum MasterCard? Previously it was Sears Financial MasterCard. I believe this card does not have any surcharge for out of country purchase. Hi WS, Are you sure the scotia card was previously the Sears card? My understanding is that the Scotia card charges a 2.5% surcharge on FX transactions. @FrugalTrader – Yes, I have this card though I do not use it. It was Sears Financial MasterCard with Chase Bank but last year Scotiabank acquired it from the Chase Bank. I also had the Sears Chase credit card when Scotiabank took over the Chase accounts and issued me a Scotia card and the information provided said there was no surcharge for foreign exchange conversions. I have used the card a number of times for $US purchases with no surcharges. Now do not know if the provision is only for previous Chase/Sears customers but would think not. How about Marriott Visa? It does not charge any fx charge. It’s not a cash back but one gets enough point to stay in Marriott. There is a $99 annual fee associated to it but it does give a night free at the beginning of year so it pretty much cover its fees. I do not know if they still have the offer but the new members get 50,000 points and that’s good enough for 6-7 nights in Courtyard Marriott plus they honor the upgrade if the suites are available. I like the Mariott card for the sign up bonuses, but not so great as an everyday use card. Do you have the Mariott card? I got an USD RBC Visa a couple of months ago and I use it for all my purchases in USD, no matter if they are done in Canada or US. This will probably save me a couple of hundred dollars in forex exchange fees over one year. Best card out of all of them is the Rogers Card. Amazon: there is no Online statements so thats an easy lost fail. Tangerine: Is a great card for low spenders but it has a 1.5% FX fee. Rogers: even if u had to pay $30 its worth having once u spend over 12,000 annually. If u spend about exactly $12,000 u should be getting $180 in cash back from Tangerine, Fido and Rogers (after $30 fee). The rogers is the card to get for those who spend more. Does the Tangerine card categories work out of country? I don’t have first hand experience, but my understanding is that it does work providing that the store has the correct merchant code for the category. Any new options in this area as the Amazon.ca Visa card is being discontinued by Amazon. I cannot see anywhere on the website that they are get a new card but it would be hard to imagine that they wouldn’t. I have found the Amazon card very useful. There are certainly online statements as well as paper. I have a TD USD Visa so only use the Amazon for Amazon and when in other countries. Have also used it to send money when children have been living in other countries. The Amazon credit card is no longer available. Chase Paymentech and Amazon have severed ties and my credit card will be defunct this March. They will send me the cash credits I have accumulated and I need to create an online profile before it’s obsolete. I’m rather disappointed since I was planning on using this card when I travelled to the US this year. Check out Home Trust Preferred Visa: no fee and NO FOREX CONVERSION FEE, just like the soon-to-terminate Amazon Visa! I’ve applied. Wow the rogers card does seem really good. I dont have any services with rogers though. Only got my 1 rbc cash back card, it could be better though. Thanks for the updated list. I used to use the Marriott Chase Visa to avoid the forex fees and charges but now I have a USD TD Visa card, and a US account. It avoids the non-preferential forex fees and this way I won’t have to worry about what the exchange rate is. These are all very good alternatives, thanks for rounding them up! It seems I’m not the only one looking for a replacement for the Amazon card! The home trust has a big drawback that should be mentioned on the article: It’s not available for Quebec. Since I live in Quebec, Rogers bank will have my business! This credit cards without an FX fee are a necessary tool on the wallet of anybody who travels outside of all inclusives, thanks for the article. I’m really sorry to see the Amazon card go. I used it exclusively when travelling outside Canada and never had a problem. I loved being able to qualify for the card online within about 5 minutes. Contrast the Home Trust Visa Card: I applied online on February 15 and I’m still waiting. When I phoned on March 5 to see how the application was going, I got a message saying that the wait time was 4 – 6 weeks. Unacceptable, in my opinion. Obviously I won’t have the card by March 15. Love the site and discussion! Thanks for sending that along Jason , I didn’t know about the changes. Will need to process the changes in my head first to see how this changes the overall fx free comparison (in addition to new cards since). there’s a new CC called brim. site and company is new. no foreign transaction fee also. Google it. great cash back on places like Costco. Thanks for the feedback. I’ve been reading up on Brim and it seems quite attractive. I’m disappointed with the coming reduction of Rogers benefits. A bit dissapointed with the changes of the terms with the FIDO/Rogers card (they arrived with the first statement. Will probably used at least until the end of the current terms and then based on the feedback about the new BRIM card, decide to keep the FIDO/Rogers card or replace it with the BRIM card.